Well, actually, they’re already here. These eight foot snails are part of the REgeneration Art Project and are made of recyclable plastic obtained from landfills. The snails are a creation of the Cracking Art Group (previously here) consisting of six international artists whose intention is to change art history through both a strong social and environmental commitment, and a revolutionary and innovative use of different recyclable plastic materials. The snails were “living” at Rumsey Field in Central Park up until last week before moving (okay, they were more moved/transported than moving themselves) to Columbus Circle last week. You’re gonna have to trust me, they’re there. That’s where I spotted them earlier today, but no time for photo-taking. Apparently there’s at least one at Eataly on 23rd Street as well. These snails seem to keep with the scavenger hunt street art theme that has descended upon our city since the fall, first with Banksy, then Invader, and now, in a smaller, yet at the same time larger, scale, the invasion of the red snails. 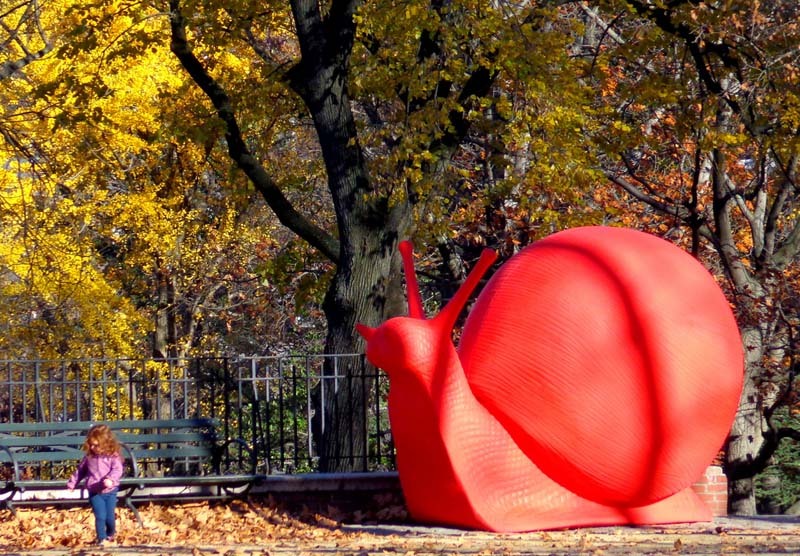 The snails will be up at Columbus Circle through January 6th, 2014, so if you happen to be in the neighborhood, do keep an eye out for them. This entry was posted in Art, Event, Fun, NYC, Pop Culture, Street Art, Stuff We Like. Bookmark the permalink.